When it’s raining or snowing I use my little Flip-Video camera to document outside events, like the approach of Hurricane Sandy. It’s small enough that I can protect most of it with my hand. The lens is completely covered by glass, so raindrops are easy to wipe off with a handkerchief. Flip-Video does not have image-stabilization, but you can usually shoot steady shots using both hands. Parts of the original clips of this video were jerky because I couldn’t use two hands. I was using one to hold my umbrella. You will notice jerkiness only in the title, “Brandywine Creek,” which introduces the sequence I shot in the pouring rain. YouTube detects jerky footage and asks whether you would like that corrected. I clicked “yes”; and to my amazement the jerky footage was stabilized very well in the uploaded footage. But interestingly, the title, which was stable in the rendered copy of the film, ended up jerky after the footage was corrected. Keep this in mind if you’re adding titles to your films. Don’t add them to jerky footage, or they’ll end up jerky in the final product. The camera gets the name, Flip, from the hinged USB tongue that tucks conveniently into the camera body. When you’re ready to download clips to your computer, you just flip out that tongue, plug it into a USB port, and drag and drop the .mp4 files from the DCIM folder of the Flip-Video contents window onto your Desktop. Very convenient! 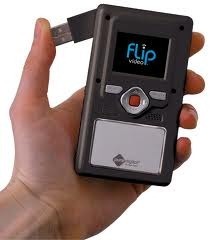 Unfortunately the Flip-video Camera isn’t made anymore. The company lost out to smart phones with HD video capability. I own a dumb phone, so am glad that I bought the Flip-Video when I did. You can probably get one cheap on E-bay. It’s a great travel tool for citizen photojournalists, especially in foul weather. For proof, take a look at my just-uploaded video (below) about Hurricane Sandy’s visit to my neighborhood. The first couple clips of this video I filmed with my Nikon D5100. That was before the rain started. Hello! I like your blog wordpress theme. Can you tell me whats the name of it? I’m new on wordpress because now i’m using just blogspot (adidasi lacoste theme). Thank you!